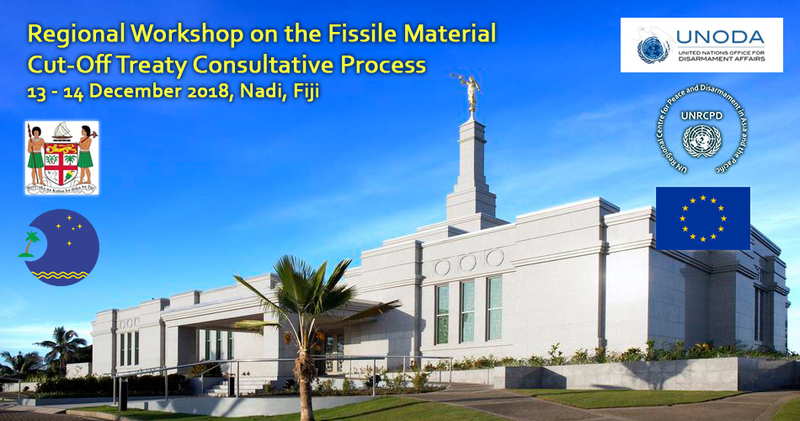 KATHMANDU, 12 December 2018 (UN Regional Centre for Peace and Disarmament in Asia and the Pacific) – The United Nations Office for Disarmament Affairs, in cooperation with its Regional Centre for Peace and Disarmament in Asia and the Pacific, is co-organizing a regional workshop with the Government of Fiji, to engage Member States of the Pacific Islands and the Pacific Islands Forum Secretariat in consultations on the outcome of the High-Level Fissile Material Cut-Off Treaty (FMCT) Expert Preparatory Group. The workshop will be held from 13 to 14 December in Nadi, Fiji. The workshop aims to facilitate dialogue at the sub-regional level among the Member States and the regional organization on a future treaty and its relationship with already existing global and regional instruments. It will also allow knowledge and information sharing on issues relevant to banning the production of fissile material for nuclear weapons or other nuclear explosive devices and will provide an opportunity to exchange views and discuss challenges and ways ahead in relation to a future treaty. The workshop is made possible with the financial contribution from the European Union.